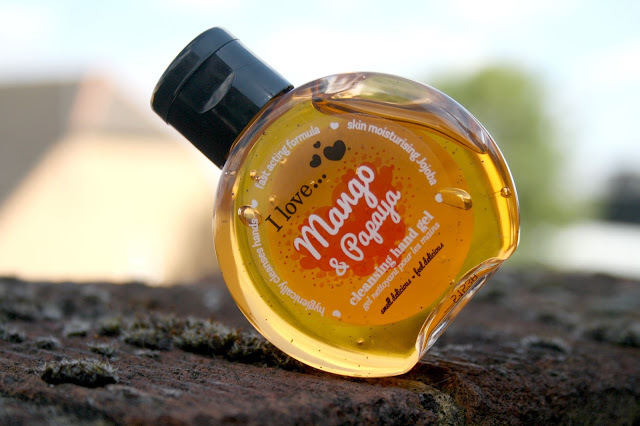 I am a big fan of the I Love... range from the shower gels and body cremes to the hand cream and these little beauties - Hand Gels oh and of course it is a British Brand, something I do like to trumpet every now and again. he one thing I love about this brand is the scents, they are a little fun, smells just as you would expect them too and they have some amazing combinations. As the weather gets colder and those pesky little germs begin to multiply, it is time to ensure you do your bit and keep them to yourselves. I do have hand gel in my desk drawer and I do often have some in my handbag too, for me it is always more of a winter item than at any other time of the year. The I Love... range, with their fabulous scents and uber cute bottles have really captured my attention and that of my boy! The formula smells absolutely as you would expect. I have both Raspberry & Blackberry and Mango and Papaya and they smell just amazing, exactly the same as other products within both of these ranges, not at all of chemicals. Once on your hands, it is really quick drying and not at all sticky or tacky as you might expect it to and the gel works to cleanse, whilst the use of natural Jojoba Esters help to ensure your hands are kept soft, smooth and really moisturised. Omg your cat!! I am sorry I am not reading your post.. I am stare it at your cat.. I am such a crazy cat lady! I keep meaning to try this range. I love the selection of flavours. I think I'll try either the mango or strawberry ones. Ooh I've not seen these before. Sound much nicer then the usual smelling ones that have my girls running away from me! This looks great for my handbag. I adore the packaging and the shape of the bottle. I've never seen these hand gels before but when I saw that you can get them in Superdrug I was not surprised. Superdrug has all the gorgeous hidden gems there. Can't wait to pop into town and pick them up. I always keep hand gel in my handbag but although they do a good job the ones I have used have a boring aroma. Next time I stock up I will be looking out for these. Ahh I am a huge fan of hand gels and I always make sure to keep one in my bag, in my room and in my desk at work - you just never know when you might need one! These ones sound great and they are so reasonable! P.S your cat is super adorable! I love this brand but I didn't know they made hand gels, I usually buy the bath and bodyworks one when I'm in America or get family to bring them back so I will be checking these ones out. These are perfect! I'm always carrying around hand gel (I know !) and it's great in the car and when you're travelling! Will be trying these. These looks really nice. I like the sound of them both but I would really love to try the Mango one. These look fab! I just bought a horrid smelling one for out and about with the kids! I'm going to look out for these! ! These look great and they have such lovely fragrances, I spend most of my working day with my hands covered in hand gel, it would be nice to smell nice too! I love to keep cleansing hand gel in my bag, never know when it'll come in handy! Sounds cliche but I love the I love... range so I may have to pick these up! I love scented anti-bac gel and what a bargain these are! Oooh I need some of these! I love their shower gels too. Hi lovely, Im liking the sound of the Raspberry and Blackberry..yum! I'm a fanatic about hand protection from germs but some are so strong and have offensive aromas. Gorgeous buddy cat btw! I love that your cat decided to "help" ;) These bottles are so cute! These are so cute! they look like little perfume bottles! OMG these are so cute. And I love love love LOVE you kitty. So cute. I think I want to pick up some of those cleansing hand gels! I reckon I'll be buying these. This range usually smells lovely.